Google hasn't had much of a problem with smartphones, as the company's Android OS continually dominated sales, earning a 49.4 percent share of the market during the last financial quarter alone. Even so, Google and one of its co-founders have made no secret of plans for Google Glass, the company's yet unreleased augmented-reality headset the company hopes will redefine how people interact with the world around them. During the TED 2013 conference in Long Beach, Calif. today, Google co-founder Sergey Brin took to the stage for an impromptu chat about what Google Glass means for the company, and the consumers Mountain View hopes will adopt the new technology. Though Google is experiencing remarkable success with smartphones utilizing its operating system, that didn't stop Brin from basically trashing the devices in favor of Glass. Calling smartphones "emasculating," Brin described the experience of "rubbing a featureless piece of glass" as incredibly isolating. "When we made [Google Glass] we thought, 'Can we make something that frees your hands and frees your eyes?'" Brin said. "That's why we put the display up high and out of your line of sight so you can make eye contact with people." 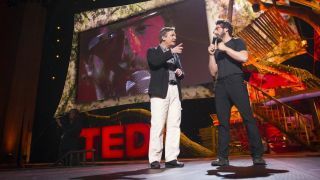 Brin added that a lot of time went into developing the current form of Glass, which he donned on the TED stage, stating it took two years to evolve beyond a "cell phone strapped to your head." Of course, Google Glass will have practical applications beyond allowing you to keep your head up and out of the miniaturized, glowing screen world provided by a smartphone. While Brin had the stage, he also discussed how Google had been researching the best way to provide information before a person knew they wanted to search for it. "Fifteen years later this is first form factor that delivers on that vision," Brin said. "We've learned a lot." Google Glass is expected to arrive before the end of 2013, though early adopters who have earned a pre-order spot will have to cough up $1,500 to get their hands on a pair. Brin promised more would be made available to the public after initial launch, and that the final retail price would fall below the $1,500 but didn't detail specifics.